When the job is to fill a large number of mylar or latex balloons, we recommend using these balloon fillers as they are designed to fill balloons uniformly so that there is no wastage due to overfilling. Some of the varieties come along with a contents gauge while some do not have one. At JTC Valve Sales, we ensure quality and durability of all our products while being rational when pricing them. Our helium balloon fillers/inflators have a forged brass body that feature hand tight connections made from plastic or brass. 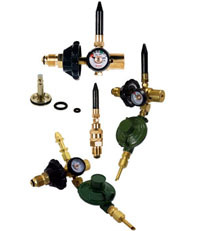 The inlet filters are made of bronze material and the rubber tilt valves are replaceable. Repair parts and accessories are also available.